You can find the podcast of my recent Sonarchy performance on KEXP here on iTunes. It’s indulgent, noisy, and probably a little irritating at times. I had a great time. Hardware Effects: Moog Filter and Delay, there is some Roland Space Echo baked in the backing tracks. Software: Ableton LIve, Max 4 Live, GRM. probably some built in Live FX. 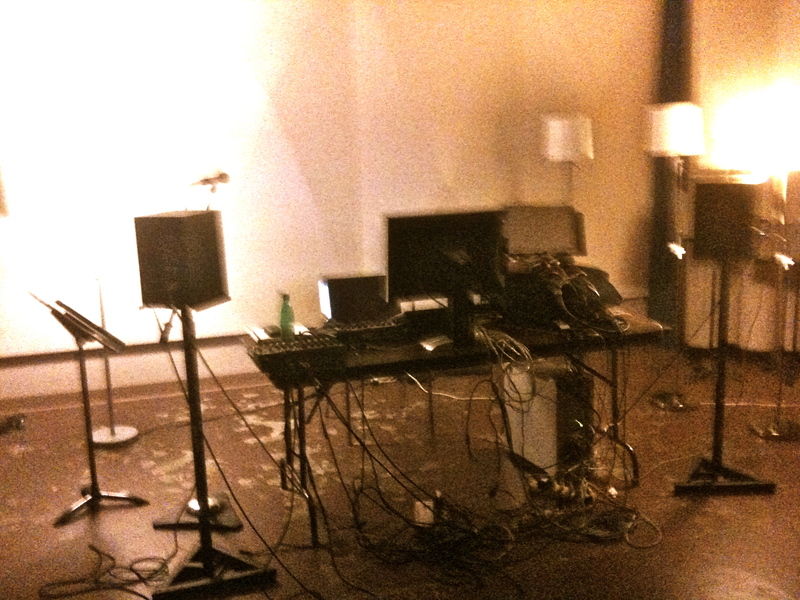 And here is a grainy photo of my setup in the studio. I lugged in a portion of my home studio. Mac Pro, Genelecs, stands and all. This entry was posted on January 29, 2012 at 2:09 am and is filed under Uncategorized. You can follow any responses to this entry through the RSS 2.0 feed. You can leave a response, or trackback from your own site.